La Vencedora Pure Mexican Vanilla Extract 31oz - 1L For 1 Glass Bottle Product From Mexico by La Vencedora at Good Time Donuts. Hurry! Limited time offer. Offer valid only while supplies last. FDA Approved, does not contain Cumarin. 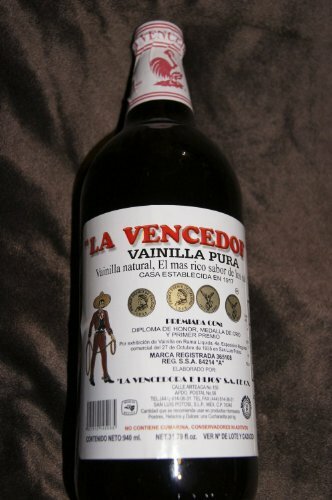 La Vencedora Ingredients: Vanilla bean Extract in Purified Water; Vanillin U S P.; Alcohol; Corn Syrup; and Natural Dark Color.